Using a paddle attachment of electric mixer beat the softened butter with the sugar for 2-3 minutes; Scrape down the sides of the bowl, then beat in the egg yolk and vanilla, mix until well combined. Then add the flour, sifted with baking powder. It should be a soft dough (similar to a cookie dough consistency). Turn dough onto a lightly floured work surface and knead lightly to bring it together. Depending on the size of your molds, you are going to have different number of baskets. 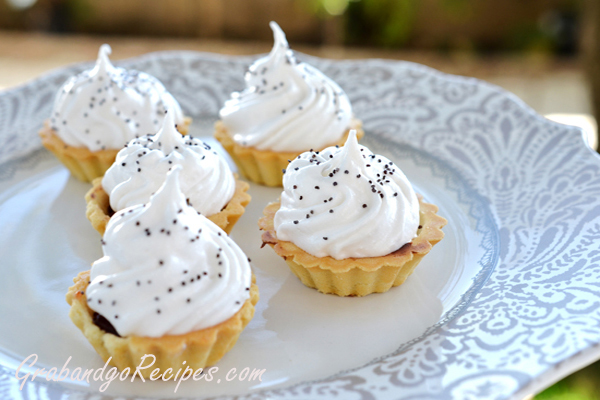 (You can use mini tart molds, or regular muffin/cupcake sheet). For the mold size from 1.75”-2” diameter, shape dough into 1” inch balls; press the dough with your fingers into the corners and about 3/4 up the sides of your molds. Bake crusts until just brown around the edges, about 25 to 30 minutes. Remove from the oven and cool slightly. Then carefully remove crusts from the muffin tin and cool completely on a rack. In a medium saucepan combine sugar and water; over medium heat while stirring bring to a boil. Let it boil for about 4 minutes. While sugar mixture is cooking, with mixer on low speed start beating the egg whites gradually increasing the speed to high, beat until firm peaks appear, lower the speed to medium and carefully pour boiling sugar mixture in it without stopping. Add lemon juice and vanilla. Turn mixer on high and mix for about 5 minutes. While mixer doing its job, top the cooled baskets with 3/4 teaspoon of fruit preserves or Nutella spread. Place piece of walnut ( I like chunks, you could crush yours) into to the center. Pour the mixture into the pastry bag with large “star” tip and by squeezing the bag make pipe on top of the filling. Sprinkle with cocoa powder or poppy seeds. And if you are big fan of caramel, drizzle some caramel sauce on top. Garnish with fresh raspberries if desired.